For holidaymakers wanting to explore the city of Durban in the lead up to the Durban Commonwealth Games 2022 or to enjoy a seaside break during the festive season the luxury hotel is an ideal choice. Take a dip in the spectacular hotel swimming pool, workout in the state-of-the-art fitness centre or indulge in an afternoon at the spa and that’s just on day one. There’s so much to experience as you live the high life and enjoy luxury and style with some of your favourite home comforts. 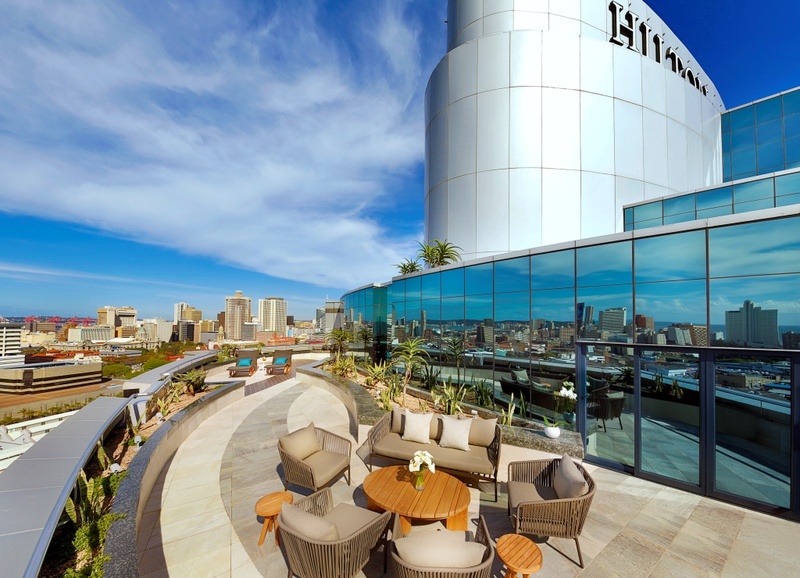 The Hilton Hotel Durban ensures you make the most of your stay and undoubtedly delivers on their promise to offer the services you need, the amenities you expect, and the extras you deserve. 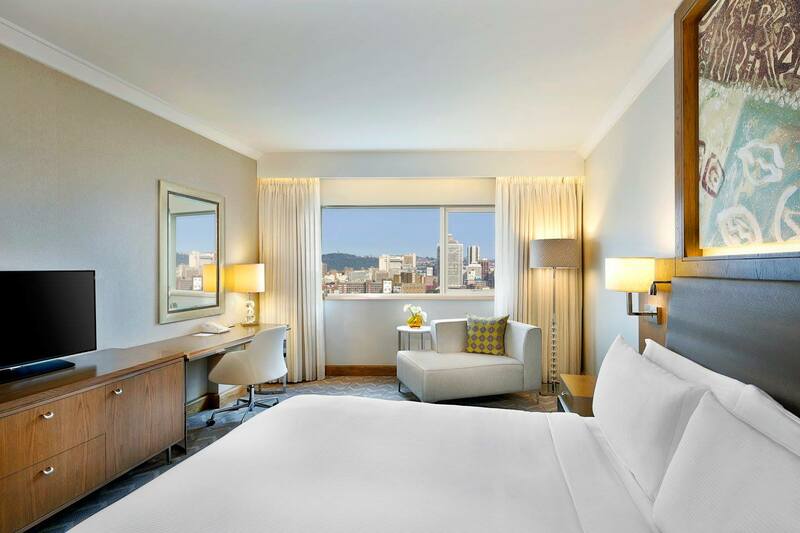 When it comes to panoramic views of the city, the rooms at the Hilton Durban hotel definitely don’t disappoint. 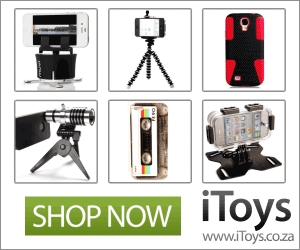 They’re comfortable and homely yet sophisticated and stylish. They’re modern yet classic and ever so inviting. 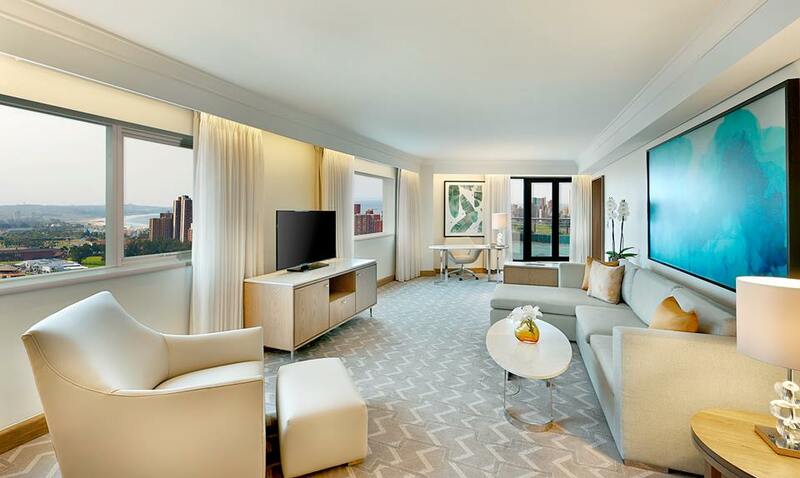 Guests have the option of a hotel’s king, twin, deluxe and executive guest rooms or the well-furnished king and twin executive suites. The rooms are equipped with a mini-bar, Wi-Fi and room service is available 24 hours a day. 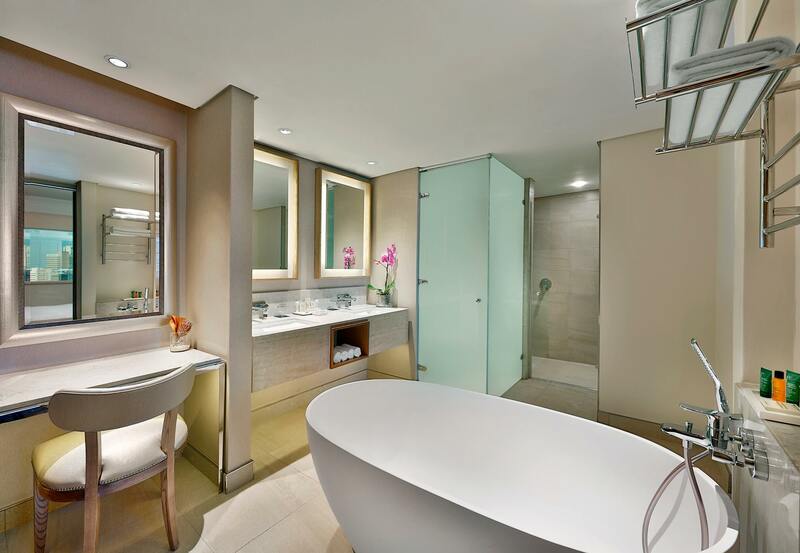 The Executive Rooms offer added features such as additional bathroom facilities, bathrobes, slippers and in-room fridge. Guests also enjoy the use of the Executive Lounge, which offers complimentary continental breakfast, snacks, fresh fruit and refreshments throughout the day. If you’re truly never off the clock then why not take advantage of the exclusive Business Lounge located on the 14th floor and enjoy an afternoon of work in true style. The lounge is open daily with complimentary continental breakfast, and refreshments, snacks and fresh fruit available throughout the day. 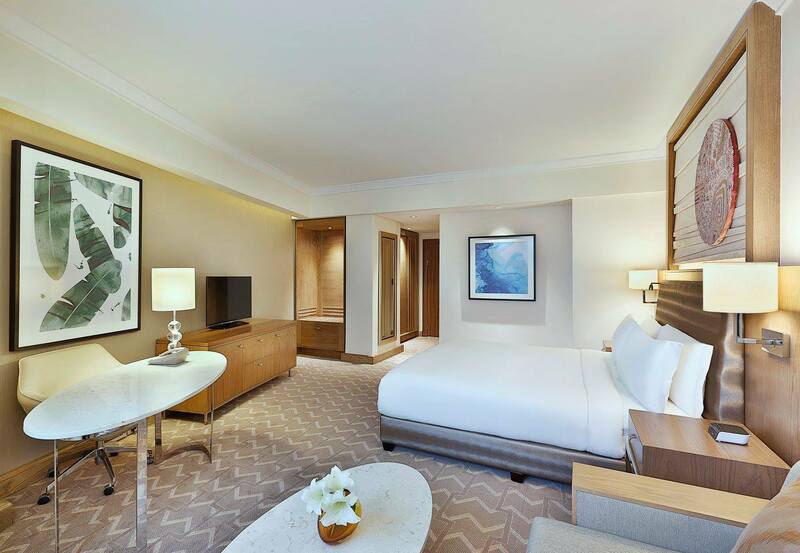 If you’re looking to experience the ultimate indulgence then we highly recommend booking a luxurious suite ranging from the Executive Suites to Junior Suites to Ambassador Suites and lastly the opulent Presidential Suite. The suites are elegant and play host to some of the most impressive city and sea views the city of Durban has to offer. 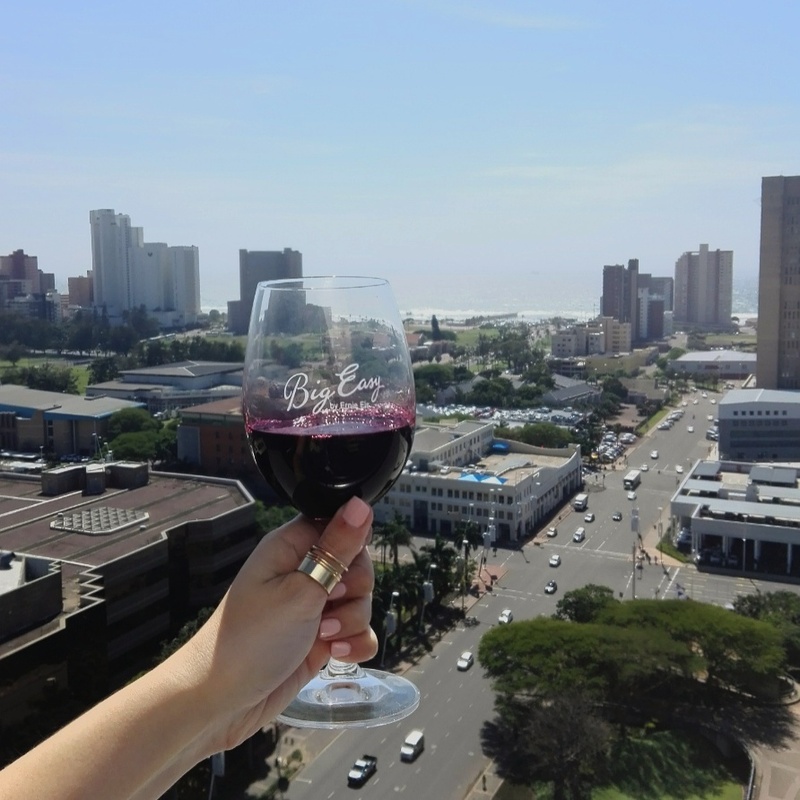 When it comes to in-house dining or visiting the hotel as a day guest, the Durban hotspot offers a variety of choices to appease your culinary palette. Fancy an afternoon of High Tea or a quick coffee and catch up with friends? 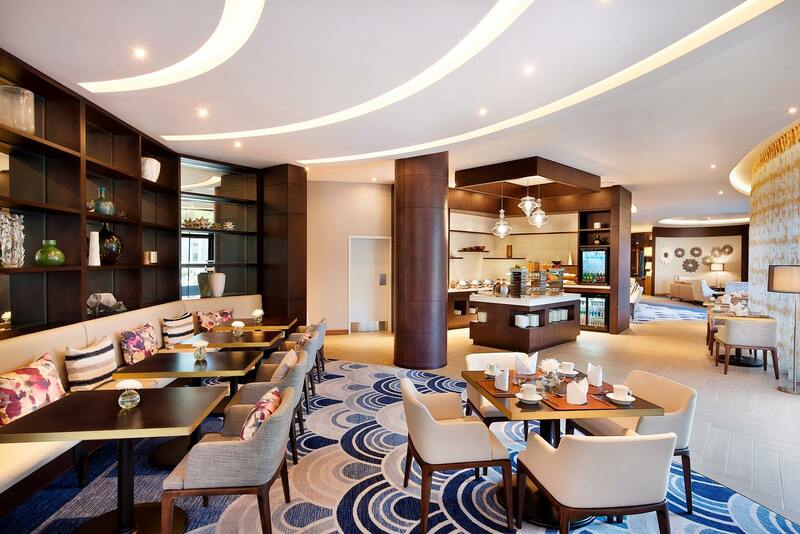 The hotel’s Coral Lounge is the perfect choice as it offers guests a vibrant little place to enjoy great snacks and great conversation. 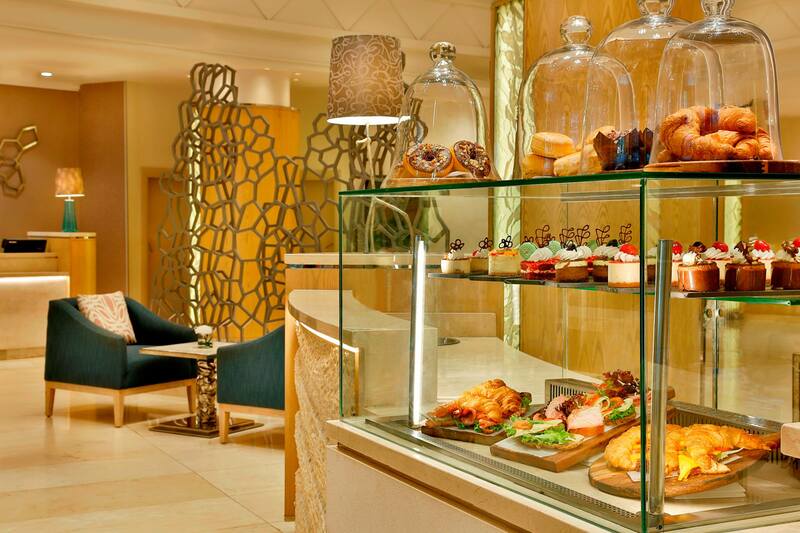 Here you can indulge in the patisserie fridge where cakes and other treats are available all day. 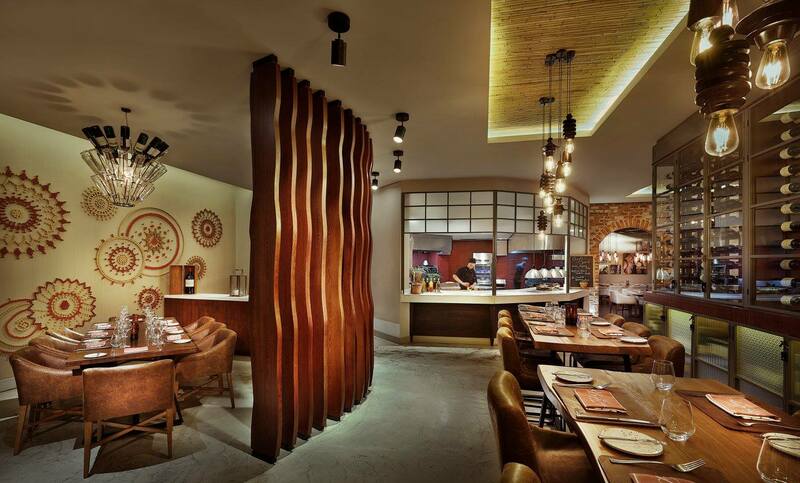 The ever stylish winebar and grill was founded by legendary golfing great, Ernie Els and has made quite its name for itself in the city of Durban. The Hilton Hotel partnered with none other than golf superstar, Ernie Els to create the unique eatery which offers guests a seasonally driven menu including all your favourites from grill to local specialities inspired by the flavours and cultures of South Africa. Premier South African wines are available as well as good whiskies and craft beer. 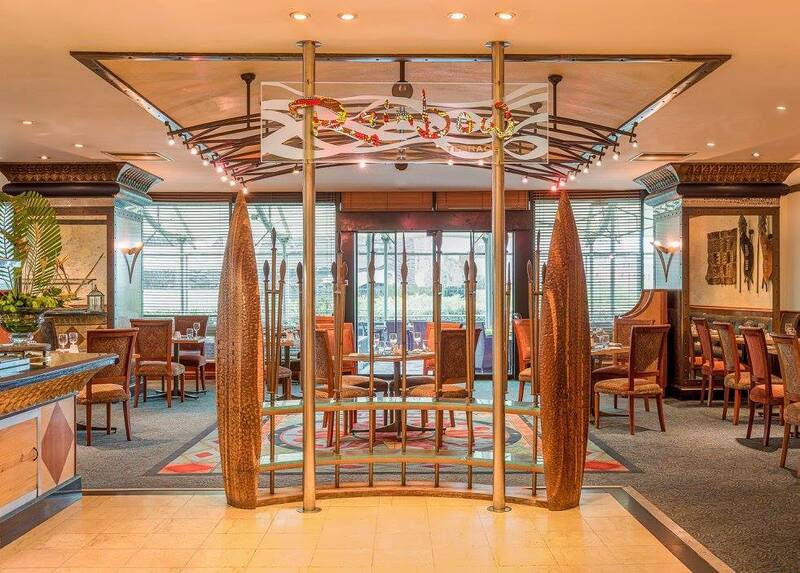 The buffet at the famous Rainbow Terrace Restaurant at the Hilton Hotel in Durban offers seasonal specialities including Indian cuisine, local seafood and even veal. The restaurant is open for breakfast and dinner and makes for the perfect choice for both guests at the hotel and Durban locals. 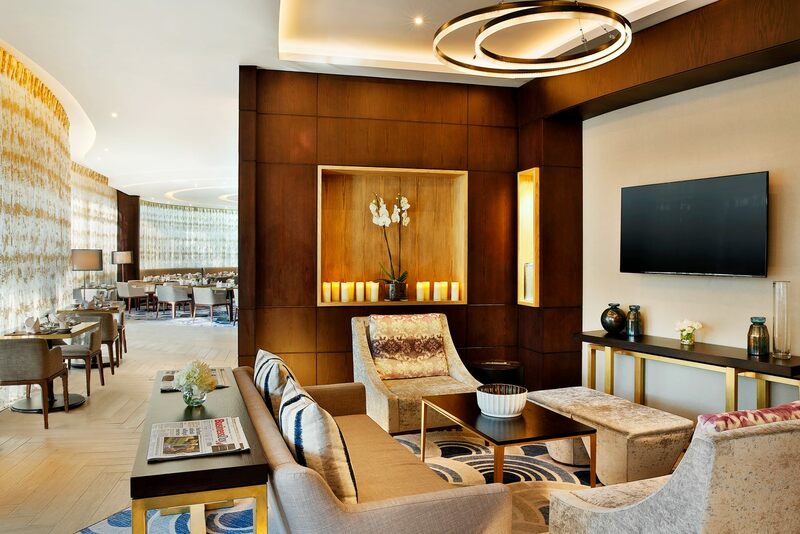 If you’re anything like The Socialite and feel like you can never truly go off the clock then the business centre is just for you as the Hilton Hotel Durban invites you to become a HHonors member. As a member you’re privy to the firm centre, office equipment is available while guests enjoy Wi-Fi connectivity. It offers 10 comfortable meeting rooms that can accommodate anything from 2 to 400 delegates and if you fancy holding a private meeting then the Boardroom is ideal as it includes catering and some of the city’s most scenic views. In 1954 at the Caribe Hilton Hotel’s Beachcomber Bar in Puerto Rico, Ramon Marrero created the first ever Piña Colada. John Lennon and Yoko Ono held their first Bed-In for Peace between March 25 and March 31, 1969 at the Amsterdam Hilton Hotel in Room 902. The Beverly Hilton has been the official hotel of the Grammys since it hosted the first ceremony in 1959. 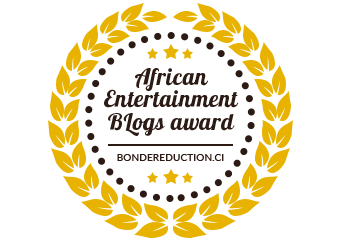 And today it hosts the Pre-Grammy Gala, the Oscar’s nominee’s luncheon and even the Golden Globes. The Hilton also plays host to the Golden Globes which have been held in the Hilton’s International Ballroom for the past 53 years.